I found this recipe here. 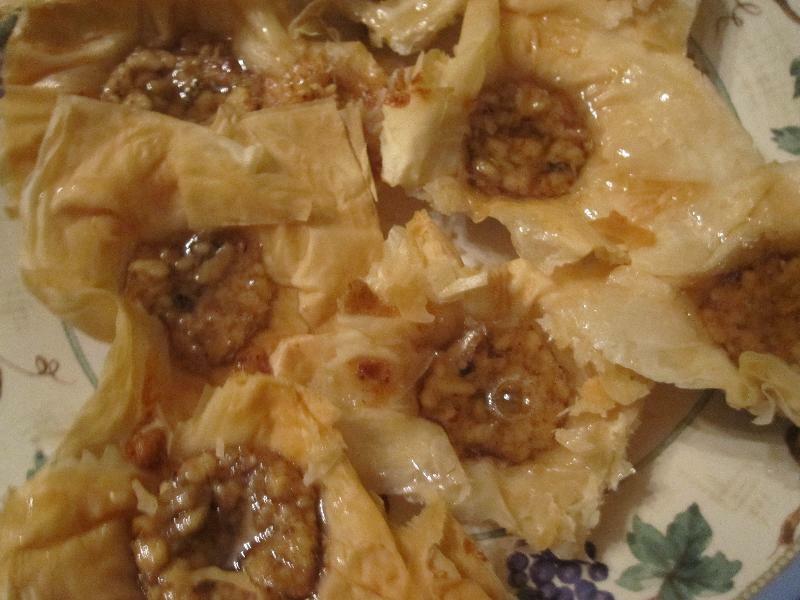 I thought that this recipe might be easier to make instead of traditional baklava. It seemed like it was just as much work. Though I did like that they were small portions to eat and I didn't have to cut the tray. I did grease the pan but they seemed very difficult to remove. Spray twenty-four 1 3/4-inch muffin cups with cooking spray and set aside. In a large bowl, stir together the egg, 2/3 cup of sugar, 2 tablespoons of honey, 1 tablespoon of melted butter, and ground cinnamon until combined. Stir in the chopped walnuts until coated; set aside. Unfold the phyllo. Place one sheet of phyllo on a work surface (cover the remaining phyllo to prevent if from drying out; see tip); brush the phyllo sheet with some of the 1/3 cup melted butter. Top with a second sheet of phyllo. Repeat brushing and layering two more times (four sheets total). Brush the top with melted butter. Trim the edges to form a 12x8-inch rectangle. Cut phyllo stack into six 4-inch squares. Repeat with the remaining phyllo sheets and butter to make twenty-four 4-inch squares. Press phyllo squares into the prepared muffin cups. Stir the walnut mixture and divide between the phyllo shells. 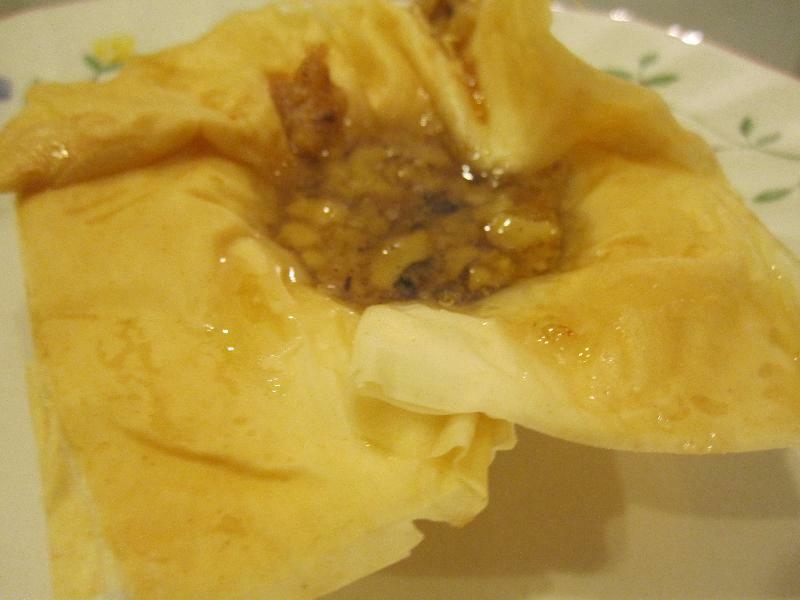 Bake in a preheated oven for 15 to 20 minutes or until phyllo is golden brown and filling is set. Cool tassies in pan on wire rack for 10 minutes. Meanwhile, for the syrup, in a small saucepan, stir together the 3/4 cup sugar, the water, 2 tablespoons honey, lemon peel, lemon juice, and the cinnamon stick. Bring to boiling; reduce heat. Simmer, uncovered, for 20 minutes. Remove the cinnamon stick. Spoon 1 teaspoon syrup over each tassie. Cool tassies completely in pan on wire rack. Carefully remove from muffin cups. Makes 24 tassies. anonymous : still more for us. You will be very busy when you are here. Mom & I will watch Derrick.